Rex Burkhead (born July 2, 1990) is an American football running back for the New England Patriots of the National Football League (NFL). He played college football at Nebraska and was drafted by the Cincinnati Bengals in the sixth round of the 2013 NFL Draft. Because of Burkhead’s versatile skill set that enables him to run the ball, catch passes, block in pass protection, and play special teams, New England Coach Bill Belichick has described him as a rare “four-down player." Burkhead with the Patriots in 2017. Burkhead was born in Lexington, Kentucky, but was raised in the Dallas-Fort Worth area of Texas. He attended Plano Senior High School in Plano, Texas, where he played high school football for the Wildcats. As a junior, he rushed for 1,762 yards and 28 touchdowns, leading the school to a state semifinal appearance in the Texas 5-A football playoffs. He earned first-team all-district honors in basketball as a junior and senior, and as a freshman he was part of Class 5A state championship basketball team. As a freshman at the University of Nebraska in 2009, Burkhead played in nine games, rushing for 346 yards on 81 carries with three touchdowns. As a sophomore in 2010, Burkhead was second on the depth chart behind senior Roy Helu. Burkhead played in all 14 games as the backup, and rushed for 951 yards on 172 carries and seven touchdowns. In 2011, Burkhead took over as the starting running back as a junior. Nebraska had little experience at running back that season, and Burkhead got the majority of the carries, including a school-record 38 carries against the Iowa Hawkeyes. He ended up rushing for 1,357 yards on 284 carries with 15 touchdowns and was named a first team All-Big Ten selection. In 2012, with expectations high, Burkhead sprained his knee in the season opener and missed two games before re-injuring the knee four games later. Burkhead missed six games total in the season, but still finished with five touchdowns and 675 yards on just 98 carries for a 6.9 yard average. He was considered the ninth or tenth best running back prospect for the 2013 NFL Draft in the top 150 overall. He graduated from Nebraska in three-and-a-half years with bachelor's degree in history. He earned repeated scholar-athlete awards throughout his career, including first-team CoSIDA Academic All-American in 2011 and 2012, and recognition as one of 15 National Football Foundation Scholar Athletes in 2012. 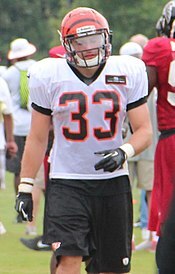 After being selected by the Cincinnati Bengals in the sixth round of the 2013 NFL Draft with the 190th overall pick, Burkhead signed with the team on May 13, 2013. Burkhead played in all four preseason games, rushing 28 times for 130 yards with one touchdown, and five receptions for 39 yards. However, plagued by a hamstring injury all season, he was active for only one of the team's 16 games, making his NFL debut on November 10 playing on special teams in a 20–17 loss to the Baltimore Ravens. In 2014, Burkhead played in nine games for the Bengals, mainly on special teams. On offense, he had nine rushes for 27 yards and his first career touchdown (against the Cleveland Browns) and seven receptions for 49 yards. He had the most productive game of his career in the Bengals' opening round playoff loss to the Indianapolis Colts, in which Burkhead started at wide receiver and totaled three receptions for 34 yards and one rush for 23 yards. Burkhead played in all 16 regular season games for the Bengals, seeing action primarily on special teams. As a running back, he rushed four times for four yards, while catching 10 passes for 94 yards and a receiving touchdown. Burkhead appeared in all 16 regular season games for the Bengals, including one start at running back. With regular playing time on offense, he rushed 74 times for 344 yards and two touchdowns. He also caught 17 passes for 145 yards. In the Bengals' Week 17 game against the Baltimore Ravens, Burkhead carried the ball 27 times for 119 yards. On March 14, 2017, Burkhead signed a one year contract with the New England Patriots worth up to $3.15 million. On September 7, on Thursday Night Football, Burkhead made his debut as a member of the Patriots. He was in the starting lineup and had three rushes for 15 yards and one reception for eight yards in the 42–27 loss to the Kansas City Chiefs. On September 17, against the New Orleans Saints in Week 2, he recorded his first touchdown as a member of the Patriots when he hauled in a 19-yard pass from quarterback Tom Brady in the first quarter of the 36–20 victory. He finished the game with three receptions for 41 yards. On November 12, 2017 during Week 10 against the Denver Broncos, Burkhead had 10 rushes for 36 rushing yards, three receptions for 27 receiving yards and a receiving touchdown, and a blocked punt. He thus became the first player to both catch a touchdown pass and block a punt in the same NFL game since 1977. Burkhead finished his first season with the Patriots with 64 carries for 264 rushing yards and five rushing touchdowns and recorded 30 catches for 254 receiving yards and three receiving touchdowns. In the playoffs, the Patriots defeated the Tennessee Titans in the Divisional Round without Burkhead, but Burkhead returned for the AFC Championship Game where he recorded one carry for five yards in the 24–20 victory against the Jacksonville Jaguars to reach Super Bowl LII. The Patriots lost 41–33 to the Philadelphia Eagles. Burkhead recorded three carries for 18 yards and caught a pass for 46 yards in the Super Bowl. On March 14, 2018, Burkhead signed a three-year contract extension with the Patriots. In Week 3 against the Detroit Lions, Burkhead suffered a neck injury and was placed on injured reserve on September 26, 2018. He was activated off injured reserve on November 26, 2018. The Patriots won the AFC East and earned the #2-seed for the AFC Playoffs. On January 13, 2019 Burkhead scored his first-ever postseason touchdown in the Divisional Round with a six-yard run against the Los Angeles Chargers in a game New England won 41–28. One week later, he scored the game-winning touchdown in overtime as part of the 2019 AFC Championship game against the Kansas City Chiefs. The Patriots won the coin toss, which eventually set up the offense with a 1st & 10 at the Kansas City 15-yard line. Burkhead ran up the middle for 10 yards and another 3 yards on the next play setting up 1st & Goal. Burkhead ran again up the middle for a 2-yard touchdown, sending the Patriots to Super Bowl LIII. Before his overtime touchdown, Burkhead had previously scored a rushing touchdown with 39 seconds left to give the Patriots a 31–28 lead, though the Chiefs responded with a 39-yard field goal to force overtime. Burkhead finished the game with 12 carries for 41 yards and two rushing touchdowns and had the game's longest run from scrimmage (14 yards). He also had four receptions for 28 yards. During the Super Bowl, Burkhead finished with 43 rushing yards, had the longest rushing play of the game (26 yards, tied with Sony Michel), and led all running backs from both teams with a 6.1 yards-per-carry average, as the Patriots defeated the Los Angeles Rams by a score of 13–3 in the lowest-scoring Super Bowl in history. In New England's three playoff games, Burkhead also totaled seven receptions on seven targets for 45 yards and registered one tackle on special teams. Burkhead's wife is named Danielle. Burkhead was the 2012 winner of the Uplifting Athletes Rare Disease Champion award. He was awarded for his work with a 6-year-old suffering from a rare pediatric brain tumor called a low-grade glioma. Burkhead’s commitment to community service has been personified by his friendship with that child, Jack Hoffman, a cancer patient from Atkinson, Nebraska. Jack contacted Nebraska in 2011, asking for a Burkhead photo. Burkhead offered to meet Jack, and his involvement in their relationship led to national notice when he arranged for Jack to suit up in a Cornhusker uniform and “run for a touchdown” in the 2013 Nebraska spring football game before a crowd of more than 60,000. President Barack Obama responded by inviting Jack and his family to the White House, and the family included Burkhead in its party. In honor of Jack Hoffman, Burkhead launched the Team Jack Foundation. ^ Forgrave, Reid (February 1, 2018). "Super Bowl 2018: Patriots versatile Rex Burkhead selfless on and off the field". CBS Sports. CBS. Retrieved February 22, 2019. ^ Wixon, Matt (February 2, 2018). "How former Plano star, Patriots RB Rex Burkhead is taking on children's cancer with his fame". SportsDayHS. Retrieved March 8, 2018. ^ "NFL Events: Combine Player Profiles – Rex Burkhead". www.nfl.com. Retrieved March 8, 2018. ^ "Rex Burkhead 2009 Game Log". College Football at Sports-Reference.com. Retrieved March 8, 2018. ^ "2010 Nebraska Cornhuskers Stats". College Football at Sports-Reference.com. Retrieved March 8, 2018. ^ "Rex Burkhead 2010 Game Log". College Football at Sports-Reference.com. Retrieved March 8, 2018. ^ "Rex Burkhead sets Nebraska record for carries in win over Iowa". ESPN. Retrieved January 29, 2013. ^ "2011 All-Big Ten teams, individual awards". ^ "Rex Burkhead 2011 Game Log". College Football at Sports-Reference.com. Retrieved March 8, 2018. ^ "Rex Burkhead perpares for last Nebraska ride". ^ Star, BRIAN CHRISTOPHERSON / Lincoln Journal. "Burkhead's Husker career down to one last game". ^ "Rex Burkhead 2012 Game Log". College Football at Sports-Reference.com. Retrieved March 8, 2018. ^ "Rex Burkhead College Stats". College Football at Sports-Reference.com. Retrieved March 8, 2018. ^ "Rex Burkhead – Nebraska, RB : 2013 NFL Draft Scout Player Profile". www.nfldraftscout.com. ^ "2013 NFL Draft Profile: Rex Burkhead". NFL.com. ^ "2013 NFL Draft Listing". Pro-Football-Reference.com. Retrieved February 7, 2019. ^ "2013 NFL Draft Listing". Pro-Football-Reference.com. Retrieved March 8, 2018. ^ "Cincinnati Bengals: Rex Burkhead". ^ "Cincinnati Bengals at Baltimore Ravens – November 10th, 2013". Pro-Football-Reference.com. Retrieved March 8, 2018. ^ "Rex Burkhead 2013 Game Log". Pro-Football-Reference.com. Retrieved March 8, 2018. ^ "Cincinnati Bengals at Cleveland Browns – December 14th, 2014". Pro-Football-Reference.com. Retrieved March 8, 2018. ^ "Wild Card – Cincinnati Bengals at Indianapolis Colts – January 4th, 2015". Pro-Football-Reference.com. Retrieved March 8, 2018. ^ "Rex Burkhead: Game Logs at NFL.com". www.nfl.com. ^ "Rex Burkhead 2014 Game Log". Pro-Football-Reference.com. Retrieved March 8, 2018. ^ "Rex Burkhead 2015 Game Log". Pro-Football-Reference.com. Retrieved March 8, 2018. ^ "Rex Burkhead 2016 Game Log". Pro-Football-Reference.com. Retrieved March 8, 2018. ^ "Baltimore Ravens at Cincinnati Bengals – January 1st, 2017". Pro-Football-Reference.com. Retrieved March 8, 2018. ^ "Patriots sign unrestricted free agent RB Rex Burkhead". Patriots.com. March 14, 2017. ^ Wesseling, Chris (March 14, 2017). "Patriots add to backfield stable with Rex Burkhead". NFL.com. ^ "Kansas City Chiefs at New England Patriots – September 7th, 2017". Pro-Football-Reference.com. Retrieved September 24, 2017. ^ "New England Patriots at New Orleans Saints – September 17th, 2017". Pro-Football-Reference.com. Retrieved October 28, 2017. ^ "New England Patriots at Denver Broncos – November 12th, 2017". Pro-Football-Reference.com. Retrieved March 8, 2018. ^ Nett, Erica. "#ProBigRed: Huskers in the NFL – Week 10". huskers.com. University of Nebraska Cornhuskers Football. Retrieved December 2, 2017. ^ "Rex Burkhead 2017 Game Log". Pro-Football-Reference.com. Retrieved March 8, 2018. ^ "AFC Championship – Jacksonville Jaguars at New England Patriots – January 21st, 2018". Pro-Football-Reference.com. Retrieved March 8, 2018. ^ "Super Bowl LII – Philadelphia Eagles vs. New England Patriots – February 4th, 2018". Pro-Football-Reference.com. Retrieved March 8, 2018. ^ Patra, Kevin (March 14, 2018). "Patriots keep RB Rex Burkhead with three-year deal". NFL.com. ^ "Patriots Activate RB Rex Burkhead to 53-Man Roster; Release OL Matt Tobin". Patriots.com. November 26, 2018. ^ "2018 New England Patriots Statistics & Players". Pro-Football-Reference.com. Retrieved February 7, 2019. ^ "Patriots vs. Chiefs – Play by Play". ESPN.com. January 20, 2019. ^ "Patriots vs. Chiefs – Box Score". ESPN.com. January 20, 2019. ^ "Rex Burkhead game log post". Pro Football Reference. Pro Football Reference. Retrieved February 6, 2019. ^ "2012 Rare Disease Champion Finalist: Rex Burkhead – Nebraska". www.upliftingatheletes.org. Retrieved January 4, 2015. ^ "Obama meets Jack Hoffman, young cancer patient who won hearts in Nebraska football game". www.cbsnews.com. Retrieved March 1, 2019. ^ "Rex Burkhead". Team Jack Foundation - Funding Research for Pediatric Brain Cancer. August 8, 2017. Retrieved March 1, 2019.